World's smallest magnetic car mount. 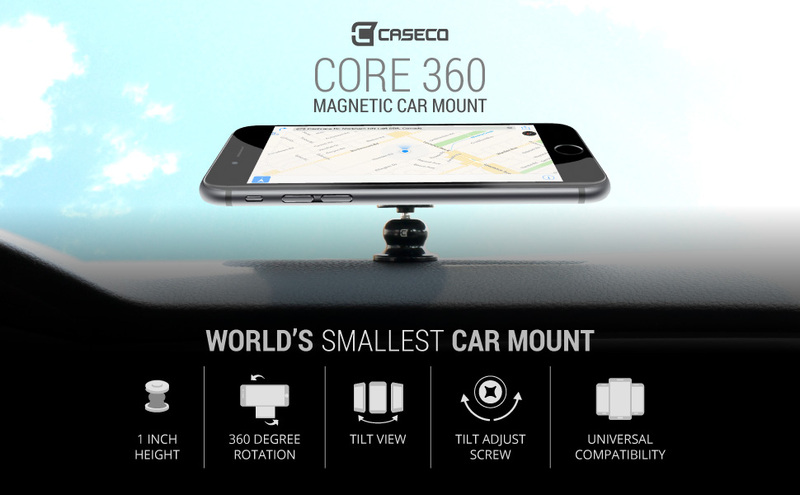 The Caseco Core 360 magnetic car mount is the perfect phone holder for your car. It docks your Samsung & iPhone devices to your dashboard in a snap. Visible, accessible, and right where you need it. 360 degree rotation with tilt view 30 degrees to either side. Metal ring (non-magnetic) attaches to your phone or hard case. The Core 360 phone holder includes high quality 3M VHB adhesives and a powerful heavy duty neodymium magnet for secure and durable hold. Make sure that your android or iPhone Smartphone will stay in place even while driving fast on uneven roads. The advanced design of this amazing magnetic car holder offers you a full 360 rotation, in both vertical and horizontal position while it can also be tilted. Keep an eye on your GPS or answer your calls hands-free, and drive with utmost safety. This handy holder is definitely a lifesaver for Uber and Lyft drivers. Thanks to its smart design, the Core 360 comes with a Tilting action. This ensures that no matter where you install this holder, your device will always be facing you for easier access. This helps focus on the road for a safer driving experience. This small phone holder comes with a screw at the bottom which makes it easier for anyone to adjust the tightness of the tilt-view function. So, if you have a heavier device, don’t worry, Core 360 can be tightened to hold heavy loads too. Unlike similar products that use magnetic rings for your phone that can demagnetize your credit cards causing you serious problems, this smart holder provides a metal ring that is not a magnet. The ring is ultra thin and almost invisible. It can be applied to any case or directly to any phone up to 1.3 LBS. I tried putting this thing in my car with both sticky pads that came with and they kept falling off so I ordered another set online thinking that maybe it was just those ones that came with the package and even with the ones that I ordered after the fact this thing won't stay on. This is so AWESOME!!! Very high quality! This thing is super strong, very durable, and works amazing! When I got my order in the mail and looked at the box's packaging, I could tell this company is legit! The 30 day satisfaction guarantee told me they believe in their products - and now I know why! I ordered other products from Caseco and I will be happy to leave a review for those as well. Nothing disappointed - in fact, everything exceeded my expectations. Totally worth it. Thank you! I will purchase again for sure! This is my favorite phone holder; I put one in every car. I can think of no way to improve upon this design. Wait: the part that sticks to the phone did not stick well on the glass-back iPhones; however, it works great on aluminum backs and plastic backs. So it has no flaws now that no phones have glass backs. Favorite magnetic mount on the market!! I love these little mounts. Very minimalist only a small washer that is stuck onto your device. The washer doesn’t get in the way in day to day use. The mount itself is very small and strong. Looks stylish and does its job very well.